A luxury new camping ground is coming to the emirate of Ras al Khaimah. Set to be completed next year, the ‘Luxury Camp’ project will be developed on Jebel Jais, the highest mountain in the UAE. The luxury mountain camp will be located at the height of approximately 600 to 700 metres above sea-level, so it will offer campers some spectacular views of the Hajar mountains. 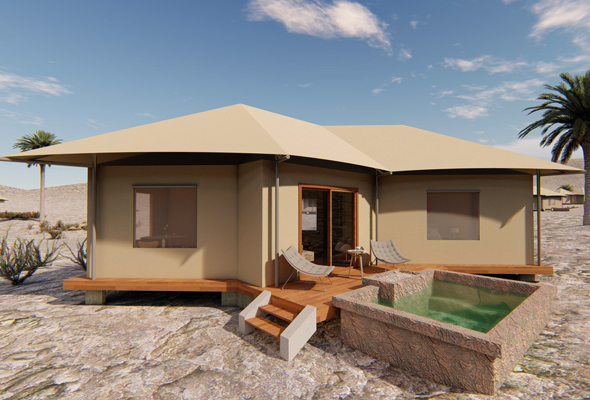 The tented camp will comprise a total of 47 luxury units split into 34 deluxe tents, 11 one-bedroom tented suites with a private pool, and 2 two-bedroom tented suites with a private pool. There will also be some luxe on-site facilities such as a health club, heated pool, spa & wellness center, kids’ play area, fire pit, and a restaurant for those that aren’t in the mood to cook. A statement also promised that the site ‘will feature the latest technology to minimize energy use and conserve water’, making it another eco-friendly addition to the tourism scene in Ras Al Khaimah. Although we don’t know exactly when the camp will open, we do know it will be open year-round when it does. The luxury camp will compliment the existing outdoor adventures at Jebel Jais, which include the Via Ferrata, a 1km hiking, climbing and ziplining strip, the viewing deck park at Jebel Jais, which is now home to an ice-rink, and the Jebel Jais Flight: the world’s longest zip-line.